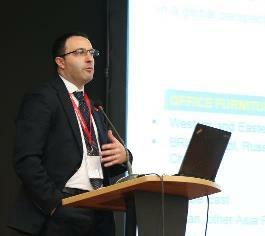 During the third edition of GOFO (Global Office Furniture Outlook) held on March 29, 2014 at CIFF Office Show in Guangzhou-China, Mauro Spinelli gave an overview of the office furniture market worldwide. According to CSIL estimates the world trade of office furniture reached US$ 8.3 billion in 2013 and it is expected to increase to US$ 8.4 billion in 2014. The main exporting countries are: China, Germany, Canada, Italy, the United States and Sweden. In particular China increased its share from 9% in 2003 to 34% in 2012. The market outlook is for continuing recession in Western Europe and growth in all other regions, particularly in North America and Asia.